Dr. Kacey DiGiacinto and Juliet Boykins were recently named to the Vice Chancellor’s Leadership Academy (VCLA) for fall 2018. 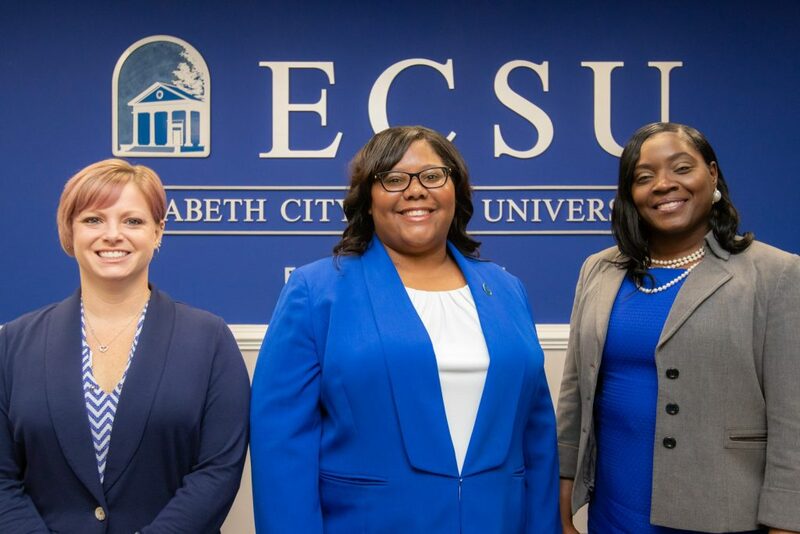 Since their appointments, they have helped to engage Elizabeth City State University faculty in leadership activities across campus. According to Interim Provost Dr. Farrah Ward, the Leadership Academy provides faculty with an opportunity to explore their leadership potential and to advance their understanding of interdepartmental collaborations. Dr. DiGiacinto was tasked during the fall 2018 semester with making improvements to the curriculum revision process for spring 2019 so all programs had the opportunity to update majors, minors, and certification programs for the 2019-2021 catalog. This process required Dr. DiGiacinto to create and revise approximately 20 documents to enhance the approval flow process. She was also responsible for providing program data related to the number of students earning minors over the last five years. All programs will be conducting reviews of their majors and minors, developing curriculum maps, and reexamining course requirements and pre-requisites to make sure they are offering competitive programming to meet the needs of future employers of our graduates. After developing all forms and processes for approval, Dr. DiGiacinto offered training workshops to program coordinators, curriculum coordinators, chairs, and interested faculty. “Ultimately, this process will lead to better career options for our graduates,” she said. Dr. DiGiacinto is also engaged in a rotation in the area of Enrollment Management, under the mentorship of Dr. Althea Riddick, Associate Vice Chancellor for Enrollment Management/Registrar. 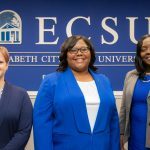 Mrs. Boykins’ primary assignment in the Office of Academic Affairs consisted of providing the Council of Endowed Professors a presentation of strategies to enhance academic life at ECSU. Prior to Mrs. Boykins’ work, the Council was functioning largely as a fundraising entity. Through Mrs. Boykins’ work, the Council decided to expand its activities to include extramural support for scholarships, mentoring new faculty, and work with the community to address issues of interest to stakeholders. In addition to her assignment in the Office of Academic Affairs, Mrs. Boykins engaged in a rotation in the Division of Student Affairs under the mentorship of Mr. Gary L. Brown, Vice Chancellor for Student Affairs. “I was able to see how the two areas, Academic Affairs and Student Affairs, complemented one another,” she said. She was able to shadow Tiffany Hinton who oversees student conduct issues. Mrs. Boykins was responsible for reviewing the student conduct policies of 15 peer universities and generating a spreadsheet of sanctions. She also had an opportunity to work in the Career Development office with the director, Makkita Whitehurst-McLean. “The VCLA experience would be beneficial to anyone who chooses to have a future in higher education administration, but would like more clarity on where they would be most useful,” said Mrs. Boykins.